Originally from Philadelphia, I have called Berkeley home for the past 30 years. I have worked as an artist-in-residence, a graphic designer and raised two children while painting and showing my art in many Bay Area alternative spaces. As a board member of the Berkeley-Sakai Association, I have traveled to Japan three times. Recently, I organized and coordinated the Berkeley-Sakai Bridge exchange and exhibit at ACCI gallery. 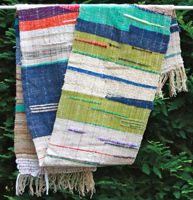 I discovered weaving at a Japanese workshop in Osaka and found that my expressionistic approach to painting is the same vocabulary I use for my weaving: by gathering information and distilling it to its essential meaning while making decisions based on colors that sing and textures that surprise. 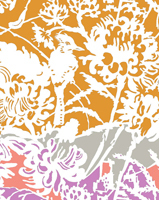 Print design and the production of silk scarves, linen pillows, and table runners are the basic products at Kevin Harris Textile. Made in Berkeley, CA, all pieces are printed with dye, or water based inks, on natural fiber fabrics. The impressions of wood-grain, animal tracks in mud, or even a river cutting through a mountain, often tell stories that I want to illustrate. I make intricate cut-paper stencils, textural photographic close-ups, and ink-brush drawings. 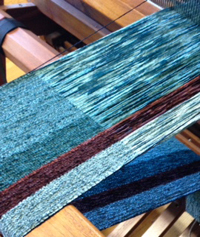 The designs depict aqueous waterways, magnified woven textures, and winter landscapes in blues and browns. 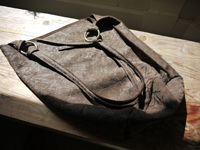 Osa Kauffman is a self-taught leather worker in San Francisco, CA, creating bags for both women and men. Osa enjoys working with leather because of its’ versatile textures and colors. Her interest in creating leather bags started when she sewed a bag for herself as an experiment to create a bag that was pleasing to the eye yet practical. Since then, she has continued to create bags in various designs and colors. Her style is characterized as straightforward and rustic with a modern edge. 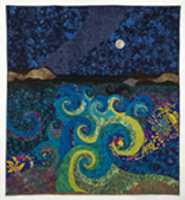 My work alternates between two art forms, quilt making and sculpture. Layering, repetition, and a metaphorical overlay of patterns and personal stories, are used to evoke the element of time. Favorite motifs include the house form and the spiral. Along with the many examples of spirals in nature such as seashells, air currents and the double helix of DNA, the psychological connotations of growth and development are appropriate and delightful associations.